Milwaukee, WI – Steel Warehouse has installed a Braner/Loopco “Cassette Leveler” Servo-Feed Cut-to-Length Line capable of processing 60,000# x 72” wide low carbon cold rolled, hot rolled, and pickled coils ranging in gauge from .020” through 1/4” at speeds to 300 FPM. 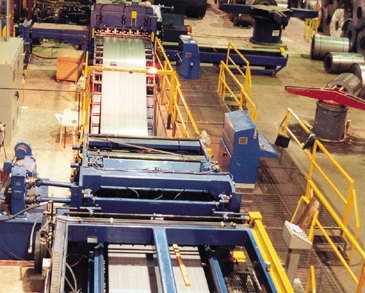 The line will handle coils in widths from 72” to 12” and produce flat sheets in lengths from 12” to 240”. Sheet pack capacity is up to 24” high x 20,000#. “Cassette” Leveler: Unlike common “fixed roll” levelers that have an inherent 4:1 gauge range limitation, the Steel Warehouse leveler is a precision 17 roll leveler capable of shape correction throughout the entire .020”-.250” gauge range, a 12:1 range. In order to produce flat sheets through the 12:1 range, the leveler is equipped with three (3) interchangeable “Cassettes”, with each Cassette containing work rolls, adjustable back-up rolls, and universal shafts sized for a specific gauge range. The small Cassette is equipped with 1.500” diameter work rolls to process a gauge range from .020” through .075”. The medium Cassette is equipped with 2.500” work rolls to process a gauge range from .050” through 3/16”. The large Cassette is equipped with 3.000” work rolls to process a through .062” through 1/4”. Each Cassette has a 4-hi roll arrangement, and each has seven (7) adjustable back-up flights. Cassettes are “injected” into the leveler frame via a powered Injector Table, and automatically connect with the main 300 HP leveler drive gear reducer. 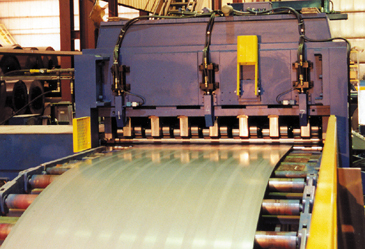 Cassettes are loaded into and withdrawn from the leveler frame in approximately 2-minutes. Benefits of the Cassette leveler include a wide gauge and product range; easier and quicker work roll, back-up, and universal shaft maintenance; and improved up-time as work roll maintenance can be accomplished while the leveler is running with another Cassette. Hydraulic Leveler Roll Positioning: The Steel Warehouse leveler employs hydraulically positioned work rolls and back-up flights instead electric motors, gear reducers, and sliding wedges commonly associated with shape correction roller levelers. Hydraulic cylinders integral with the leveler frame are located at the front and rear of each lower back-up flight in each Cassette. Each hydraulic cylinder is equipped with a precision linear electronic transducer that reads the exact position of the cylinder rod. By adjusting the entry end and exit end cylinder elevations, the work rolls can be “tilted” front to back to eliminate coil-set. By adjusting the cylinder elevations from side-to-side, the back-up flights can be positioned at various elevations to accomplish “roll-bending” for shape correction. The ability to make independent back-up flight adjustments front-to-back as well as from side-to-side gives the hydraulic leveler greater shape correction ability when compared to a mechanical leveler. Computer Leveler Controls: Because the hydraulic leveler has so many back-up flight and work roll position adjustments; it is not reasonable to expect an operator to be able to adjust the leveler cylinders manually. The Steel Warehouse leveler employs a computer that positions the back-up flights and work rolls. The operator inputs the material yield strength and gauge into the controller and the computer automatically calculates the proper entry and exit work roll gap dimensions and sends the commands to the cylinders. Each cylinder transducer transmits its position back to the computer as it automatically moves to the proper elevation. 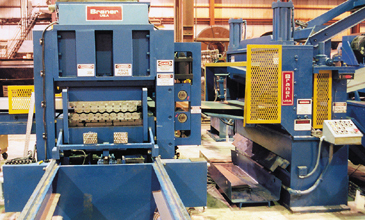 After the work rolls are positioned to eliminate coil-set, elongating the strip center and/or edges to correct for edge wave and center-buckle is accomplished by operator command as the strip is run through the leveler. A computer memory is available to commit the back-up and work roll positions to a 100-job memory for future recall. This feature is a valuable time saver particularly when processing partial coil runs. All levelers must be calibrated from time to time, a time-consuming job with mechanical levelers. The hydraulic leveler computer has an “automatic calibrate” function that allows the leveler to be automatically calibrated in a few minutes without tools.